Bunny doesn't like to stay still so she's never in focus. It's so amazing to see how the hamsters have warmed up to Michael, me, and life in our household. It's also fun to notice the differences between their personalities, although Hammy is still undergoing some changes. Bunny is the more adventurous one. She doesn't get spooked easily, and we like to joke that she does not care at all. I could poke her in the eye (not that I have) and she would sit there, not caring or even acknowledging what I did. She's sleepily greeted me and proceeded to fall asleep in my hand as I pick her up and snuggle her several times now. I don't mean to wake her up, I just get worried that I can't see her breathing and open up the area she's in to check on her. Bunny enjoys scurrying around wherever she is, whether it's a new setting or not. She's a shy eater, though, so don't expect her to nibble in front of you. Instead she stuffs her food into her food pouches for later on when she's in her private pantry. Hammy has changed a lot in the past month and a half. She was the smaller of the two hamsters, so when they fought she would simply lay on her back and let herself be attacked. It translated to lots of anxiety and stress after they were separated, and I have had my work cut out in building up our relationship. Picking her up wasn't something I could ever count on, as the moment you touched her she would scurry for the closest hiding place she could find. I wasn't even comfortable trying to pick her up to bring her to the bathtub for some bathtub bonding (a method recommended to help your hamster warm up to you and to strengthen your relationship). Instead there was a lot of placing my hand near her with some food on it to coax her out. Now she actively comes to my hand and will walk onto it with little to no hesitation. She still gets antsy about being picked up at times, so I have to tread carefully with that as she continues to warm up to being handled. I have been able to clean her home and rearrange stuff without her scurrying to her hidey holes. Instead she'll actually get in my way by being a curious little fluffybutt, crawling on my hand and sticking her head wherever I'm working. I'm too happy with her coming out of her shell to be annoyed at her hindering whatever I'm doing. Now for the big event in my life/the hamsters' life. Shortly after my post that introduced the hamsters to this little corner of the internet, I was contacted by someone from Kaytee who offered to send some stuff to assist in my plans for habitat expansion. What I didn't expect was the amount of stuff they actually sent. The day this arrived in the mail, all I could do was sit and stare at it for several minutes before taking pictures to send to Michael, who knew I had been contacted by the company. After the initial shock and excitement wore off, I immediately got to expanding the hamsters' homes. This is how Hammy's home turned out. If you look really hard, you can see her in the blue loop-d-loop tunnel above the red section of tubing. She's really taken to that area as her hidey hole. This is how Bunny's home turned out! Her two favorite spots are the outhouse (purple/green thing that is behind the curved red tubing) and the snap on wheel. I find her all over the place, though. Recently she's taken to sleeping in the purple loop-d-loop. I hypothesize that she likes feeling tall. Now for my disclaimer: as you can probably figure out, this stuff was sent for free. 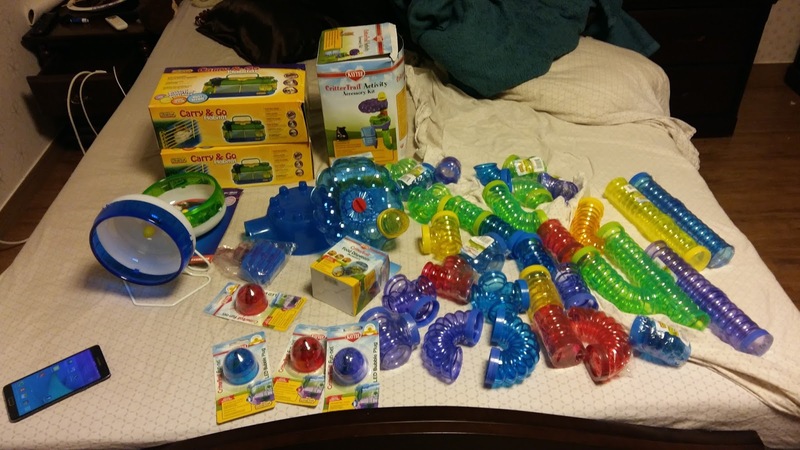 All that was asked of me, however, were some pictures emailed to the representative showing how I built up each hamsters' home, and to let them know what I thought of their new LED bubble plugs. I made my own decision to blog about it and share their kindness here. Thank you again. Now that all that is out of the way, on to my expansion plans! I plan to eternally expand the hamster homes until our entire house is taken over. LOL. Okay, not exactly, but I do plan to continue to expand each hamster's habitat until I feel they have a large enough space to call home. That will likely take a while, as I have a habit of spoiling my pets. Ask my old winter white dwarf hamster. For the two and a half years I had her before she died, I was always working on her home, adding to it and rearranging everything to keep her stimulated. That's it for my little update on our hamsters. I hope everything's going well in your corner of the world, and if you have any pets that they are in good health and enjoying life! I was convinced it was just a troll trying to waste my time until I got the shipping notification, and even then I was in disbelief until the boxes arrived. I'm still in shock every time I think about it! Exciting! Your two furbabies are living high on the hog! Scarlette has a gerbil but we just keep it in a simple cage. That is a challenge enough for her to keep clean and take care of. She holds Sunshine so much anyway she barely has time to hang out in the cage. Savanna has a bearded dragon in a ginormous glass tank. Toddles roams the house freely with the exception of our bedroom. Adam won't allow her in there so she doesn't go. She doesn't go in the girls' rooms either. Toddles favorite room is the computer room. I sewed her a fluffy pillow to sleep on and put it under my sewing machine and she sleeps on it. She also likes the couch and laps. Enjoy your sweet little fuzzybutts. I think Scarlette is wanting a snake after Sunshine departs this earth. She is two now, so it might not be much longer. Your home sounds like a wonderful place full of pets and love! I would have had more pets growing up if we weren't moving around all the time. It wasn't until we moved to Texas and Mom knew she was retiring that we were allowed to adopt pets. Snakes are awesome pets! My Aunt had one, as well as a gecko, and those two critters were some of the most loving pets I knew growing up.